Ableton’s Drum Rack instrument has its own integrated send/return section, which allows you to add return effects to individual drum samples. 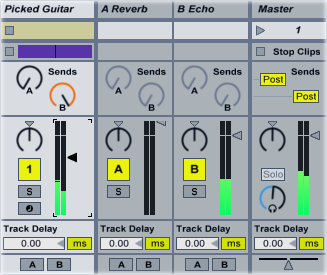 You don’t, however, necessarily need to add the effects plugin to the rack; instead, you can use the send/return section to route individual drums to the master return channels. Let’s look at a situation in which this is useful. Open the Drum Rack and click the “I-O,” “S,” and “R” buttons in the corner of the rack. This opens up the Drum Rack’s send/return section. Right-click the panel that says “Drop Audio Effects Here” and select “Create Return Chain.” You’ll now have an empty return chain inside the Drum Rack. Select “A – Reverb” (or whatever return channel you’re using) from the “Audio To” menu. This routes the audio from the Drum Rack’s return chain straight to the master return channel. Turn up the “Send-a” control in the “Snare” column; the snare channel is now being sent right to the reverb. The audio from the guitar channel is now going to the echo channel, from which it runs straight into the reverb channel. If you only want to hear the reverberated sound, set the echo channel’s “Audio To” menu to “Sends Only.” This tells Ableton that you don’t want to hear the echoed sound until after it’s passed through the reverb channel. If you want to create some intense feedback, turn the channel volume down, then send a return channel to itself. Try resampling the feedback that this creates, then trimming it down into a sound effect. 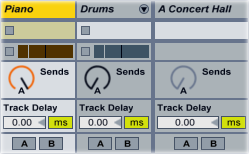 Like most of Ableton’s parameters, sends are automatable. Right-click one of a channel’s “Send” knobs, then select “Show automation in new lane.” Draw in the automation envelope; try making the reverb send level swell up over the course of a breakdown. You can also automate the effects on a return channel; just right-click one of the effect’s controls, select “Show Automation,” and draw in an envelope.